Why do we leave the last button of a waistcoat undone? We can trace this back to King Henry VIII. It was considered a huge insult to Henry because he couldn’t see his toes, let alone fasten the bottom button of his waistcoat. His courtiers took it as a style ‘initiative’ and followed suit, hence it becoming ‘the’ way to button a waistcoat. It remains a point of style even today and most well dressed men will leave their bottom button undone. See also: Bespoke Tailoring, bottom button, button, Henry, Henry VIII, king henry, Waistcoast, Waistcoat. 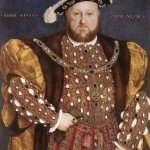 King Henry VIII & The Last Button of a Waistcoat - Bespoke Suits By Savile Row Tailors.